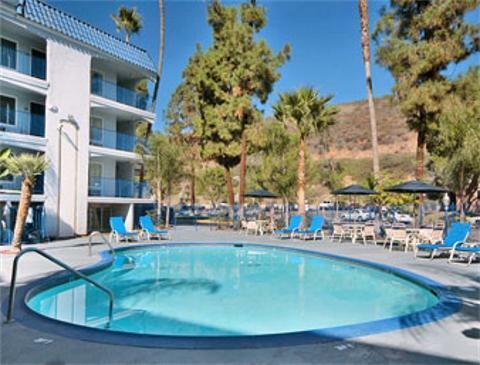 Like a breath of fresh air you will enjoy all the comforting Days Inn Mission Valley/SDSU has to offer. The Days Inn experience promises comfort and a staff of professionals who go out of the way to make sure every stay is a pleasant one.Unlike other hotels, you can always count on us for a comfortable, clean room, and a full size kitchen with microwave - we do not provide utensils in our rooms. Our property features a complimentary continental breakfast daily, outdoor pool, spa and sundeck. Also for the business traveler we offer complimentary wireless internet access in all rooms. Lots of free parking and guest laundry for your convenience.Days Inn Mission Valley/SDSU is less than 6 miles from two world class shopping centers with over 160 shops, theaters, and restaurants. You will be conveniently located less than 10 minutes from Sea World, San Diego Zoo, Balboa Park, Old Town, San Diego Harbor, Mission Bay, Gas Lamp Quarter, San Diego International Airport, and the Convention Center.All reservations have a 24 hour cancellation policy. When making a reservation please note to all guest that the maximum length of stay at this establishment is 28 days. The hotel reserves a right to cancel a reservation in an event of an emergency, We do not provide truck parking. We Do Not Allow Pets. We are NOT located on the Waterfront.